Though I am not that good at watercolors, I wanted to give it a try for the Moxie Fab World challenge. I used some blues and greens and painted randomly on a piece of heavy weight paper. I let some of the colors drip down. 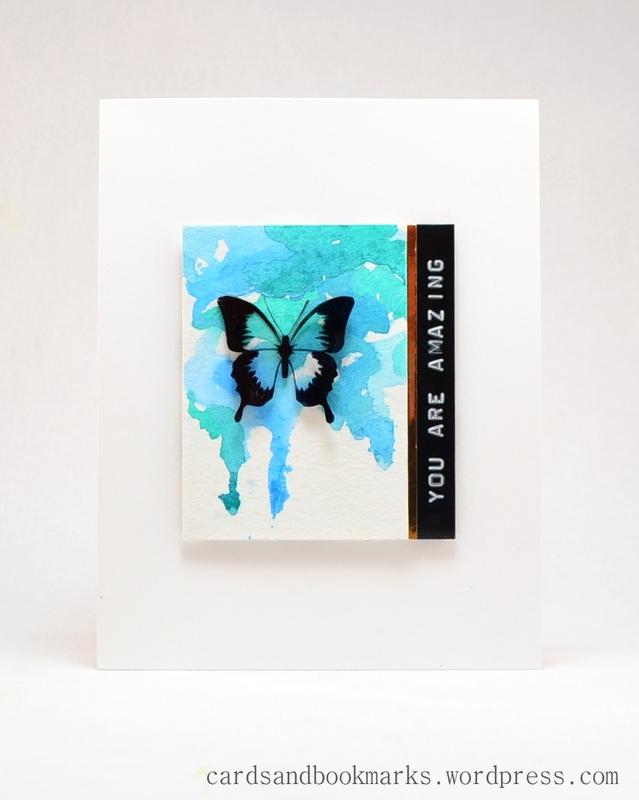 The butterfly was stamped with black Stazon on acetate and trimmed out. The sentiment is from a label maker. I adhered all pieces on a piece of card stock (so they would be well aligned) which was then adhered onto the card base with foam tape. Oh but you are good at watercolors. This is a lovely and clever card which I happily plan to CASE. The use of the gold strip really sets the rest of the card off. Nicely done. 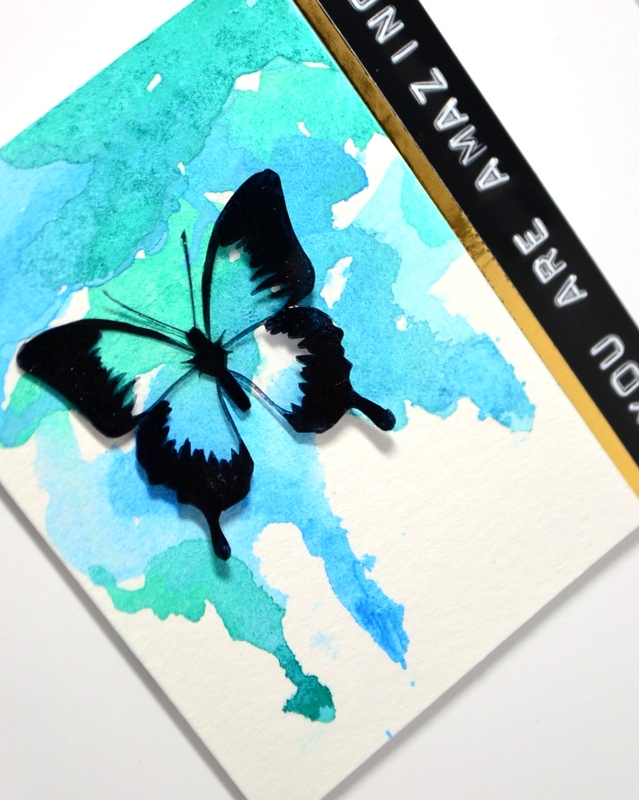 You created an amazing piece of art Tasnim, love your creativity of stamping the butterfly on acetate and adhering on the wonderful watercolor panel. Love it:-)!! Ummm, “you are amazing!” Seriously, you should just give this card to yourself. Love the combo of the cool colors in watercolor with the snappy gold foil. Then the label maker kicks it up another notch. A truly beautiful card, Tasnim! Outrageously awesome card Tasnim!!! It’s a masterpiece! um. Gorgeous! Love how you did the butterfly. And the contrast with the trendy dymo label. AMAZING is the perfect word for this card! Love it so much Tasnim!!! Tasmin, I love the transparent butterfly with the blues and aqua shades glowing through. Such a delicate yet powerful image. Gorgeous, Tasnim! You always rock the Moxie Fab challenges. 🙂 And now I really want a label maker! LOL! Just beautiful – those colours are so striking and the black against it – wow!! how gorgeous….I think you are great at watercolouring…. Oh my Tasnim, this is so pinned! This should be the WINNER!! I love love love it, Tasnim! Again, you have blown me away!! Wow…this is stunning! I love what you did with the background. Absolutely stunning! Every element so perfectly placed and I think the colours and the effect of the paint dripping down is breathtaking! One for framing! !